Phil Emery hopes to imrpove the Bears roster in the draft. Phil Emery addresses the media before the draft. 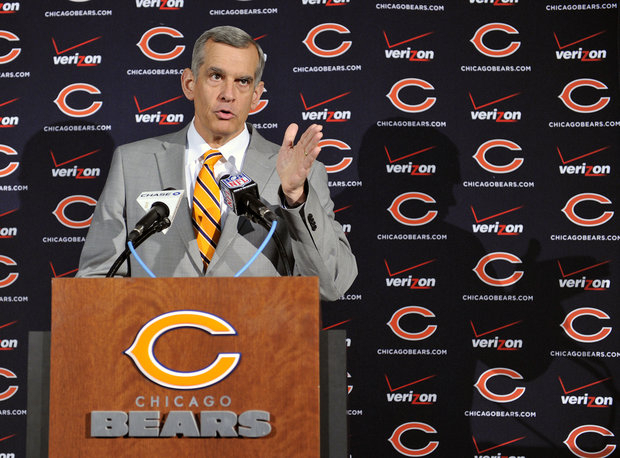 Thursday is every holiday rolled up into one for Chicago Bears General Manager Phil Emery: the start of the NFL draft. Several free agent signings in recent months have peppered this team with some needed help. But the loss of some players to free agency and the decision to go in an alternative direction has re-shaped the Bears. There is also the desire to find replacements for woeful players. Emery is talking all calls to move out of the first round with the team’s 20th pick for the right deal. If the Bears GM could grab two more selections and fill positions like offensive guard and linebacker, a trade would be welcome. This will be the first draft in a long time without Lovie Smith involved. Emery now has his handpicked head coach Marc Trestman. There is no doubt Emery is focused on what this team needs. When former number one draft pick Gabe Carimi is moved from tackle to guard and still has to compete with new free agent signee former Jets guard Matt Slauson and second year player (undrafted) James Brown you know the Bears feel that position may still be inadequate. Offensive coordinator coaching guru Aaron Cromer says he doesn&apos;t care where a player is drafted. He will start the best five to protect the quarterback. The only returning starting linebacker is 32-year-old Lance Briggs. Brian Urlacher is still waiting by the phone for a NFL roster spot. Nick Roach signed with Oakland. Emery didn’t hesitate to sign a couple of linebackers to one year deals: former Denver bronco D.J. Williams and former Carolina Panther James Anderson. Williams has a checkered past. Maybe a new team will help him settle down. You can’t forget last year the Bears dealt two third round draft picks for troubled Brandon Marshall. That deal not only worked out, it showed the Emery has guts. The Bears have a couple of back-up quarterbacks on their roster: Josh McCown and Matt Blanchard. Neither is the future (or the present). Jay Cutler will likely enter the season in the final year of his deal without a contract extension and the Bears would love for him to have a monster year. The Super Bowl Champions in Baltimore had the same scenario last year with Joe Flacco. They are paying Flacco a ton of money now and their salary cap was decimated. But they will get their championship rings in a few months. Sometimes you have to gamble and gladly win in the end. The Bears should look for a quarterback in the draft. Seattle found Russell Wilson in the third round last year. Maybe there is another gem hidden in the middle rounds. Emery addressed the offensive line’s biggest need by signing left tackle Jermon Bushrod. Getting tight end Martellus Bennett adds another weapon for Cutler. But if another quality tight end is available the Bears would likely make that selection. The Bears may need to look for some youth at cornerback. Charles Tillman is 32 and injuries are a factor. Both starters Tillman and Tim Jennings were Pro Bowlers last season, but the league is full of talented and big wide receivers. Another cornerback could be necessary. After the draft, the Bears will likely continue to fill out the roster with undrafted players, free agents and unsigned veterans. One Bear who is still sitting waiting for a team is defensive lineman Israel Idonije. The NFL salary cap has hampered most teams. Veterans like him will either take a big pay cut or may be forced into retirement. Urlacher is in the same boat.